Social Media Success Summit 2011 – It’s On! 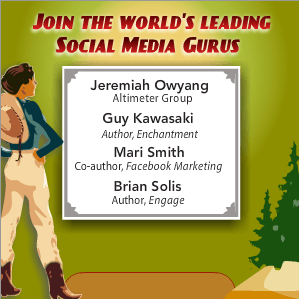 It’s an exciting day, and the lineup for the 2011 edition of Social Media Success Summit has been announced. As a presenter, I am of course biased, but this may be the best combination of social media thinking in one virtual conference ever assembled. Do you agree? I’ve been a part of several of these summits – including the recent Blogging Success Summit. They are universally of extreme high quality, attract a huge audience (last year’s social media success summit had 2,500 registrations) and are an incredibly good deal. The event (again, it’s a series of Webinars) runs throughout the month of May, and you get access for a full year thereafter. My session is “How to Hug Your Calculator: The 6 Step Process For Measuring Social Media”. It’s on the last day, May 26. Sign up for Social Media Success Summit now, using this link or http://bit.ly/SMsuccess and I make a few bucks. I hope to see you in the Webinar room. If you have any questions about SMSS, shoot me a note.